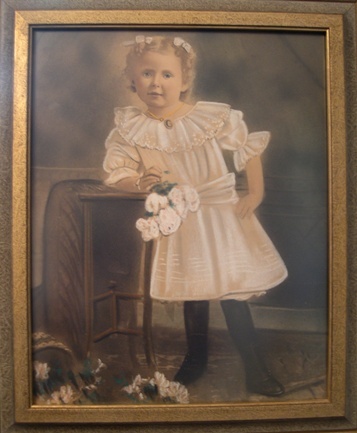 The picture on the right is a pastel drawing of my grandmother Mary Dean who was born in 1899. It was the inspiration for a small quilt I made for my mother Martha Ann Dean Boyce in 1991. I had taken a class and the teacher had given us the basic template for a quilt such as this. I don't remember the woman's name but if someone lets me know who it was I will include that information here. Anyway, I decided to adapt some of the details from this picture that hung in my mother's home to make the details of the quilt. 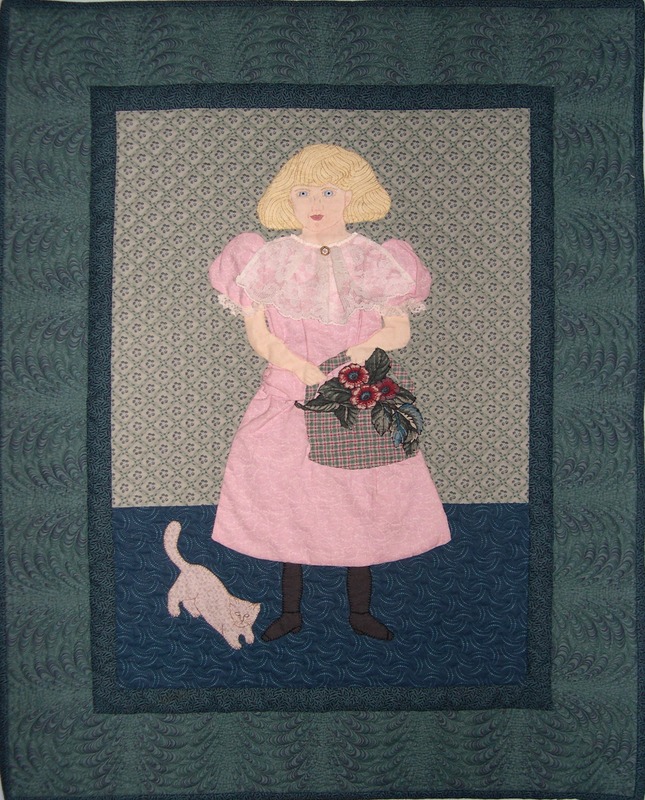 The laces and the button on the quilt were both from my grandmother's stash. And I tried to make the dress style on the quilt like Nana's. What I could not do was the hair. Instead I looked at my daughter Jill's hair at the time to make that part of the quilt. And so it was the combination of those elements that gave me the name of the quilt, Sweet Mary Jill. And what quilt would be complete without a kitty? The wallhanging is 24" x 31". It is hand appliquéd, embroidered, and quilted. You can take a look at the details by clicking on the quilt once you have linked to it. This is one of my favorites. There is a little story I enjoy telling about this quilt. 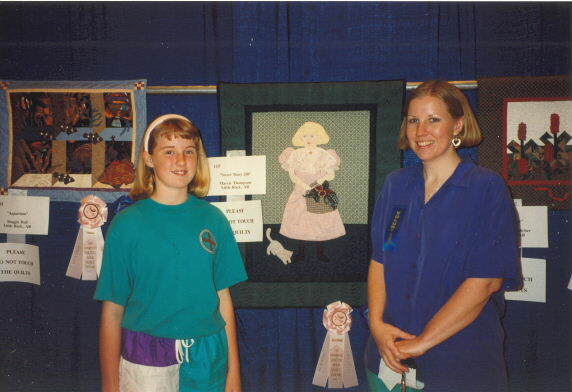 I entered it in a show in the handpieced and quilted small quilt catagory, the same catagory that Irma Gail Hatcher had entered a quilt. She decided at the last minute to "perfect" her quilt by adding a few extras. In the linked picture of Jill above you can see Irma Gail's quilt behind me. Yes, she won but I did receive a ribbon.